Indiana’s four year colleges are strongly encouraging students to complete Indiana’s Core 40 with Honors Diploma requirements. As a responsible parent or student, do you personally know what Indiana requires for high school graduation or have you relied too much on the school counselor or fate? IBE’s new YoungSTARS Nikki, Jamal and Phoebe are neighbors with very different family dynamics which causes them to rely heavily on each other to stay on top of their grades and classes. 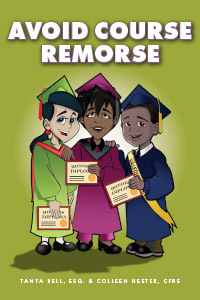 Through their voices, Avoid Course Remorse provides students with everything they need to strive for high school completion within four years with the right courses, the right amount of credits, the right grade point average and the right attitude. Avoid Course Remorse also shares a child’s perspective on the importance of parental involvement and provides ways parents can remain involved in middle and high school. As teens, mentors, friends and role models, IBE’s YoungSTARS share their personal challenges and experiences to encourage students to maximize opportunities to enhance their future.